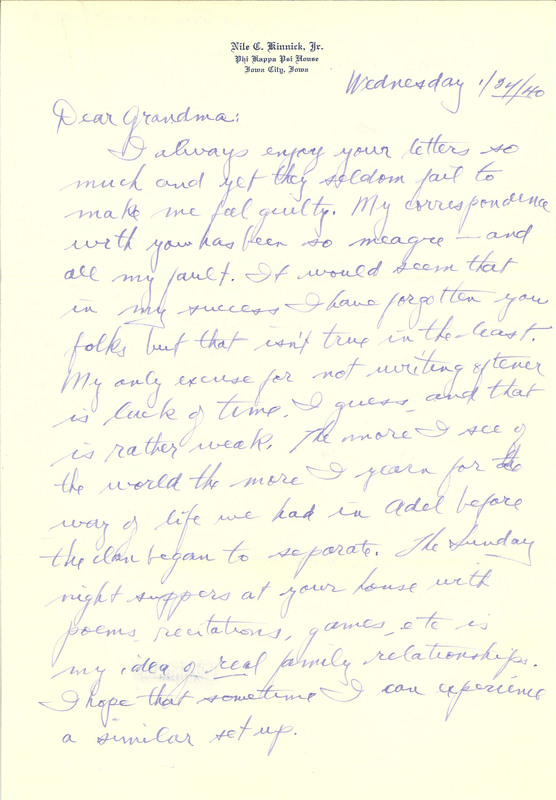 Nile C. Kinnick, Jr. Phi Kappa Psi House Iowa City, Iowa Wednesday 1/24/40 Dear Grandma: I always enjoy your letters so much and yet they seldom fail to make me feel guilty. My correspondence with you has been so meagre - and all my fault. It would seem that in my success I have forgotten you folks but that isn't true in the least. My only excuse for not writing oftener is lack of time, I guess, and that is rather weak. The more I see of the world the more I yearn for the way of life we had in Adel before the clan began to separate. The Sunday night suppers at your house with poems, recitations, games, etc is my idea of real family relationships. I hope that sometime I can experience a similar setup.